Welcome to my world friends. The magic of our Skyland is what I try to weave into my artwork. This with an ounce of humor, a pinch of nostalgia for what we recall fondly, the moment (if I am lucky enough to capture it) along with generous pattern and color. The animals that live out on our little island are my dearest friends. I am never alone or bored. The light, the wind and the changing colors of nature fill me with joy. If I can bottle this and it can come out of my brush into something that delights you, my work is successful. The goldfinch visited again this morning lifting our hearts. He perched on a branch down the driveway and was lit up by the sun. I still see him there in my minds eye. A picture memory gifted. The persistence of lovely memory folds into what I create. 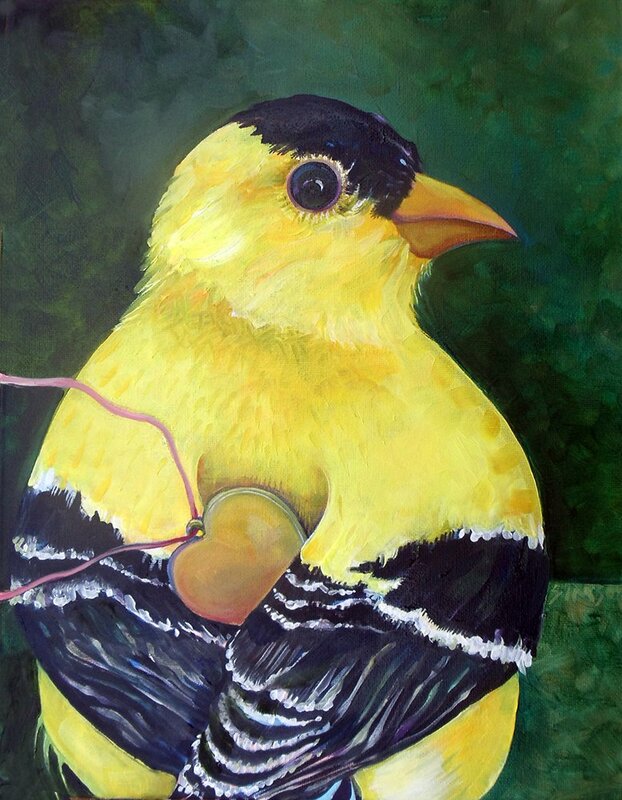 The goldfinch painting showing him holding a golden heart depicts the joy I felt in seeing him. This image- called “Keep a song in your heart” is one of my most treasured illustrations. While the original painting was snapped up, it is available in prints. You can also find it on other things on my website; a gift card, clocks (both pendulum or shelf design) my “lookinglass ornaments and jewelry. The handsome little finch is the state bird of New Jersey, Iowa, and Washington, is welcome and common at feeders, where it takes primarily sunflower and nyjer. Goldfinches often flock with Pine Siskins and Common Redpolls. Spring males are brilliant yellow and shiny black with a bit of white. Females and all winter birds are more dull but identifiable by their conical bill; pointed, notched tail; wingbars; and lack of streaking. During molts they look bizarrely patchy.